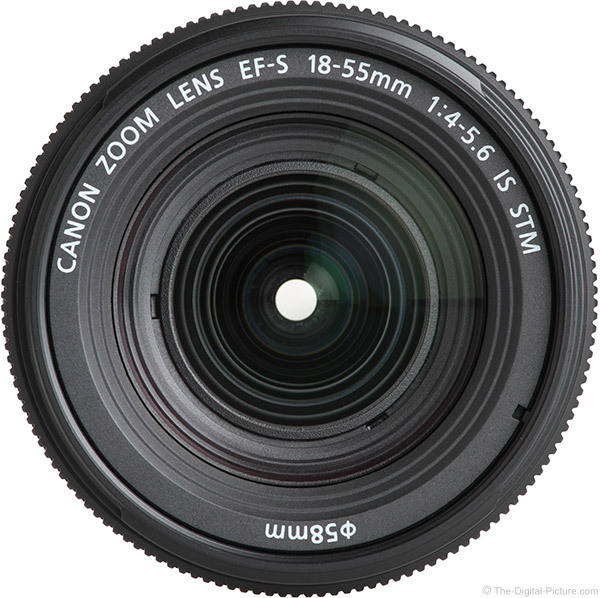 The Canon EF-S 18-55mm f/4-5.6 IS STM Lens is the 6th Canon APS-C kit lens having this same focal length range (not counting the EF-M variant and a III version available in a limited number of countries). Out of these 6 lenses, only 2 have featured a version number in their names, meaning that there was an acronym or feature change referenced in the name, keeping it unique. Until this lens was announced, name-included changes were the addition of image stabilization (IS) and the immediate predecessor lens received the "STM" designation, indicating that it featured Canon's Stepping Motor-driven AF. Even though this is the 6th such lens, a version number is once again lacking. 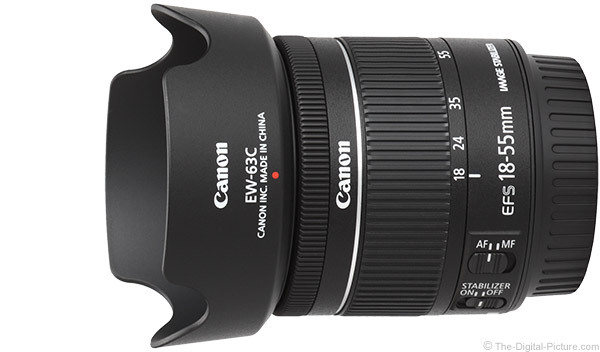 Though at first glance, this lens appears to have the same name as its predecessor, the Canon EF-S 18-55mm f/3.5-5.6 IS STM Lens. But, look closely and you will see the widest angle max aperture has increased by 1/3 of a stop, from f/3.5 to f/4. While a narrower max aperture is seldom welcomed from a brightness perspective, one benefit of a narrow max aperture is smaller size and this lens brings that. 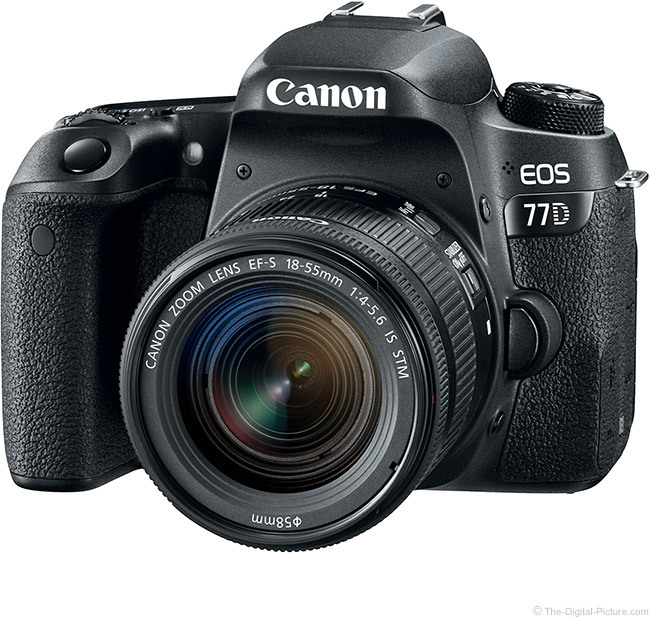 The predecessor is a small lens, having a 2.96" (75.2mm) length spec. 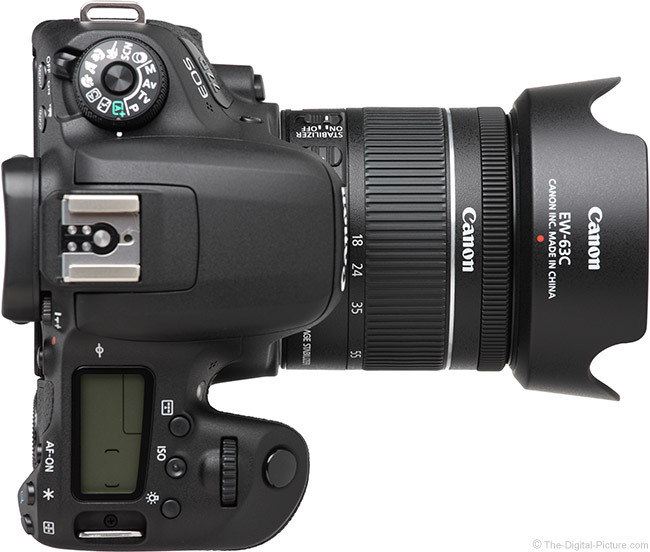 The f/4-5.6's length spec is only 2.43" (61.8mm) for an 18%, .53" (13.4mm) reduction. Kit lenses included with APS-C format DSLRs (such as the Rebel Series and 70D/80D DSLRs) typically represent a good value, meaning you get a useful lens for a low price. To be useful for a large percentage of camera-with-kit-lens buyers, the focal length range must fit general purpose needs. To keep the value part of the equation, the price must be low. People typically buy DSLR cameras because of the image quality they deliver and Canon initially indicated that the new lens would have image quality similar to the previous version, which was ... reasonable. 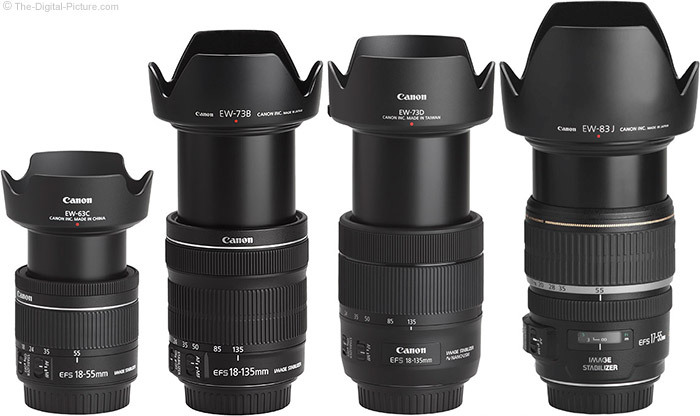 As with the 5 similar kit lenses that came before it, the Canon EF-S 18-55mm f/4-5.6 IS STM Lens promised to be a good value. While some of the EF-S 18-55mm lens iterations appeared to feature mostly cosmetic improvements, the "STM" version of this lens came with some definite advantages over its predecessor, the Canon EF-S 18-55mm f/3.5-5.6 IS II Lens, which continues to be available at review time. A smaller size, minimally, is going to be a welcomed by most kit lens buyers. As everyone would expect from a kit lens, this lens is designed for everyone's most-common focal length needs. 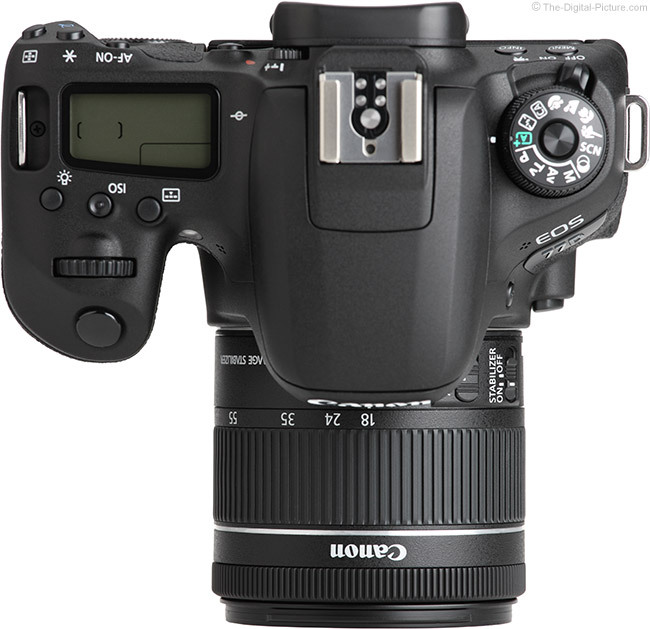 The Canon EF-S 18-55mm f/4-5.6 IS STM Lens' focal length range falls squarely in the recommended general purpose zoom lens focal length range for ASP-C/1.6x FOVCF sensor format DSLRs including the Rebel series, **D, ***D, ****D and 7-series models (this lens is not compatible with full frame DSLRS as its image circle is not large enough to cover such sensors). An 18mm focal length acts like a 28.8mm angle of view on a full frame DSLR camera (the conversion is helpful to many of us). This is a moderately wide angle of view that is common with EF-S zoom lenses, but 18mm may leave you wishing for modestly wider on occasion, especially when photographing wide landscapes, interiors and architecture. The 55mm end frames like 88mm on a full frame camera. This is a nice angle of view that encompasses portraiture, though you might want to save the tight headshots for a longer telephoto lens. Portraits taken from a close distance will start to show a bit of perspective distortion (including big noses) and are best avoided. Here is an example of the 18-55mm focal length range. Note that these images were captured with the predecessor lens. The same images from the new lens would look ... the same. Really, this focal length range finds usefulness practically anywhere, from in the house to at the park, from in the city to in the wilderness. It is useful for capturing life as it happens. The f/4-5.6 in the product name specifies how wide the lens aperture is able to open. Because aperture is measured as a ratio of lens opening to focal length and because this lens' maximum opening does not increase enough with focal length increase to maintain the same ratio, the max aperture is a variable one, ranging from f/4 to f/5.6 as the focal length range is traversed. 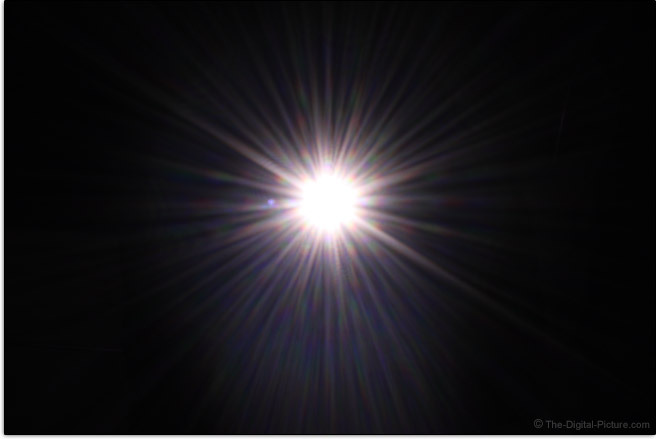 As always, the lower the aperture number, the more light the lens will allow to reach the sensor. Each "stop" in aperture change (examples: f/2.8, f/4.0, f/5.6, f/8, f/11) increases or reduces the amount of light reaching the sensor by a factor of 2x (a big deal). Allowing more light to reach the sensor permits freezing action, handholding the camera in lower light levels and/or use of a lower (less noisy) ISO setting. In addition to allowing more light to reach the sensor, increasing the opening permits a stronger, better subject-isolating background blur (at equivalent focal lengths). Also, lenses with an opening wider than a specific aperture (usually f/2.8) enable the higher precision AF capabilities (most often the center AF point) in some cameras and present a brighter viewfinder image. That said, this is one of the narrowest-aperture lenses available in this focal length range. While narrower is never better from a low light perspective, narrower apertures have some very nice advantages. Because the size of the lens elements can be reduced significantly, narrower aperture lenses can be lighter in weight and lower in cost. Those are two factors that we all can appreciate and they are especially desirable in a kit lens. The variable max aperture has the same two advantages, compounding the benefit. A downside to the variable max aperture is that, by definition, the widest max apertures cannot be used over the entire focal length range. Your camera will automatically account for the change in auto exposure modes, but those making use of the widest-available aperture in manual exposure mode encounter a complication. Again, this lens has a relatively narrow aperture at the widest focal length and by 55mm, it has the narrowest max aperture found with any frequency in any 55mm lens. This is not an ideal lens for stopping low light action. When the sun goes down, action sports photographers using this lens (or similar models) will be reaching for very high ISO settings to keep images bright enough with the short shutter speeds needed to freeze their subjects' motion. This lens is not a good choice for indoor sports or other similar subjects. This lens will not provide the brightest viewfinder image possible. Here is a table comparing the max aperture step down focal lengths between the Canon EF-S 18-55mm f/3.5-5.6 IS STM Lens and alternative Canon lenses. If your lens is missing from this list, head over to the full Canon EF-S 18-55mm f/4-5.6 IS STM Lens specifications using the site's Lens Spec Comparison Tool that enables far more comparisons. Overall, the f/3.5-5.6 predecessor lens has a 1/3 stop advantage throughout a significant portion of the focal length range. On many cameras, the sharpness-reducing effects of diffraction kick in with some strength at f/11 through f/16 (depending on the DSLR being used), so there is a somewhat narrow range of sharp apertures remaining for use. Fortunately, those remaining apertures are quite useful. One of the advantages of using DSLR cameras is the subject-isolating background blur they can create. The larger imaging sensor is a key in this effect, and while not the largest sensors out there, the APS-C sensors that EF-S lenses are designed for are much larger than most other camera types. Wider apertures work in conjunction with longer focal lengths to create a shallower depth of field (DOF) and with the out of focus area being enlarged courtesy of the longer focal length, a stronger blur results. Basically, the Canon EF-S 18-55mm f/4-5.6 IS STM Lens is not going to win many competitions over other similar lenses in regards to background blur strength, but it is able to create a respectable amount background blur with a close subject, distant background and 55mm f/5.6 selected. Move back to about 6' (2m) and even a distant background remains in identifiable focus at these settings. Advances in DSLR low light performance (reduced high ISO noise), make even slow (narrow aperture) lenses more useful and, image stabilization comes to the rescue for low light motionless-subject photography. Image stabilization has (practically) become a standard zoom lens feature these days and it is extremely valuable to me. In-lens IS allows sharp images to be captured from a camera handheld at very long exposures and it also provides a stabilized viewfinder image that aids in subject framing. 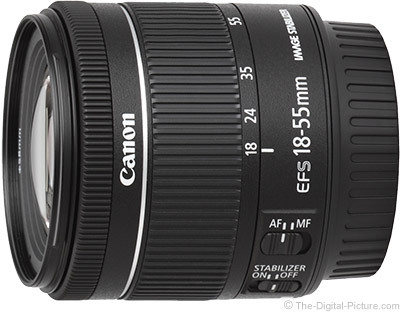 The Canon EF-S 18-55mm f/4-5.6 IS STM Lens, like its predecessor, features a 4-stop-rated IS system. With each stop being a 2x change in the amount of light reaching the sensor, 4 stops of assistance means that you can shoot in 1/16th as much light as without IS (1/2 x 1/2 x 1/2 x 1/2). That difference is huge. Image stabilization does not stop subject motion, but it makes a remarkable difference in still subject photography. 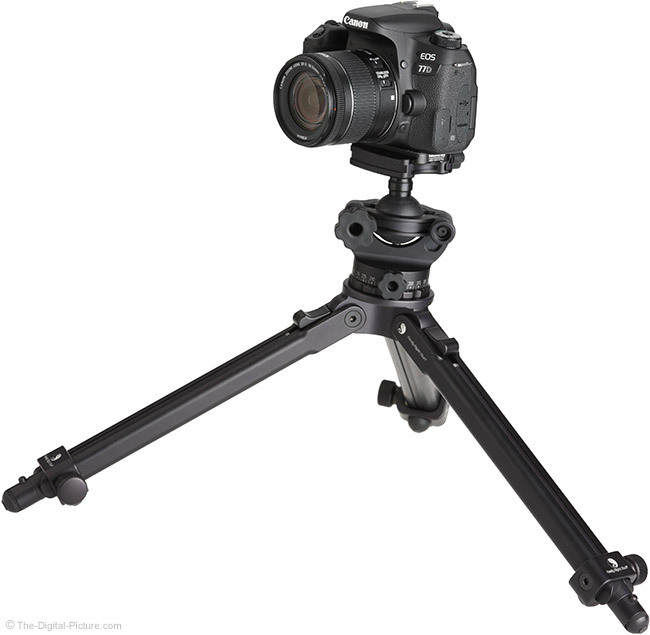 Image stabilization has matured significantly over the years. This lens’ IS implementation performs similarly to its predecessor (and that is good). This system is virtually silent (inaudible in sound recorded in-camera during video capture) and the image framing does not jump around at startup or shutdown. For the price of the lens, the overall IS system quality seems remarkable. You are buying a DSLR camera to get great images and great image quality is a significantly important part of a great image. Canon set the expectations for EF-S 18-55mm f/4-5.6 IS STM Lens image quality to be similar to that of the EF-S 18-55mm f/3.5-5.6 IS STM Lens, even though the optical formula is slightly different for these lenses (12/10 elements/groups vs. 11/9). What I'm seeing is that the f/4-5.6 image quality is indeed different and overall, modestly improved. At its widest apertures, the EF-S 18-55mm f/4-5.6 IS STM Lens shows reasonable center-of-the-frame sharpness over the entire focal length range. As preferred, there is little or no reason to select a specific focal length for sharpness purposes and little improvement is seen by selecting a narrower aperture (stopping down). That near-best performance is found at the widest apertures is especially valuable for a lens that does not open very wide in the first place, leaving little room for stopping down prior to the effects of diffraction beginning to cause overall softness to set in. While the center-of-the-frame performance is not amazing, it is not bad for a lens costing this little. In addition to our standard lab tests, I like to share some real world examples. 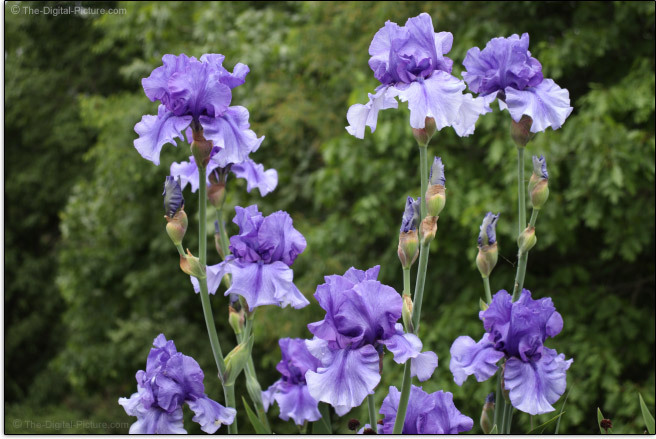 The images below are 100% resolution crops captured in RAW format using a Canon EOS 77D. The images were processed in DPP using the Standard Picture Style with sharpness set to "1". These examples are from the center of the frame. Note that these samples were captured on a low-contrast cloudy day. I prefer to show outdoor samples captured in direct sunlight, but ... the sun didn't cooperate with that plan. Because the softening effects of diffraction becoming visible by f/8 with this camera, I didn't share the f/8 results in these comparisons. None were sharper than the f/5.6 results. Lens corner-of-the-frame performance usually trails the center performance and that is the case with this lens, especially at the wide end of the focal length range. 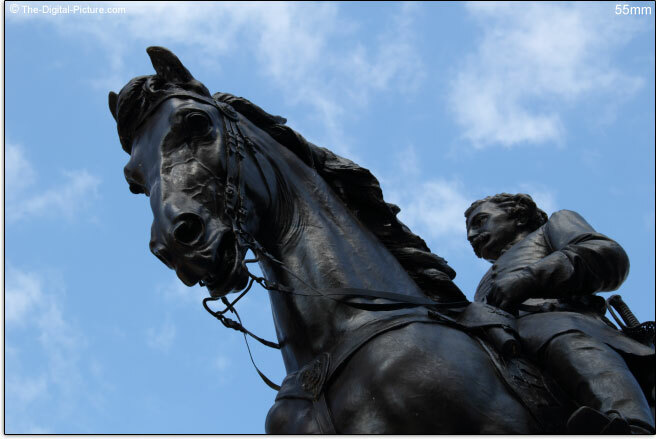 As the focal length increases, the corners improve until they become good at 55mm f/5.6. Of course, f/5.6 is stopped down for much of the rest of the focal length range and all focal lengths turn in decent corner performance at f/5.6 with 18mm remaining the weakest. When a lens is used on a camera that utilizes its entire image circle (nearly always with this lens), corner shading is nearly always present at the widest apertures. Stopping down significantly resolves this vignetting and you can see that happening in the examples above. At 18mm, there is a noticeable about-2.5 stops of shading deep in the corners. The longer focal lengths fare better, showing roughly 1 stop of wide open corner shading, a just-noticeable amount in many scenarios. But again, the wide open aperture narrows at the longer focal lengths and at f/5.6, the 18mm shading is just slightly stronger than that amount (about 1.5 stops). At f/8, about .5 stops of shading remains in the corners, an amount that is not often recognized. If all of the wavelengths of light in the visible spectrum refracted identically, a lens designer's job would be a lot easier. Because they do not, we get aberrations caused by various wavelengths of light being magnified and focused differently. 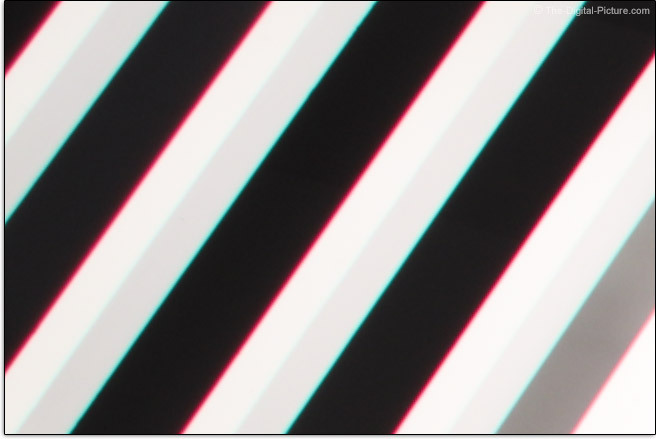 The most frequently noticed type of CA (Chromatic Aberration), lateral (or transverse) CA, shows as different colors of the spectrum being magnified differently with the mid and especially the periphery of the image circle showing color fringing along lines of strong contrast running tangential (meridional, right angles to radii) as this is where the greatest difference in the magnification of wavelengths exists. If it is a general purpose zoom lens, lateral CA is probably present. 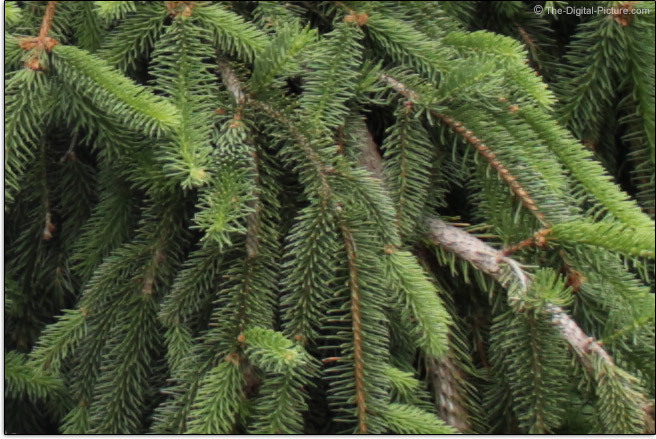 Following are 100% crop examples taken from the upper-left corner of an EOS 77D frame. While the 18mm example is very colorful, that is not what we want to see here – there was only black and white in the subject. The lateral CA is quite strong here and improves very slowly until 55mm where it becomes practically unnoticeable. Fortunately, lateral CA is rather-easily software corrected (often in the camera) by radially shifting the colors to coincide. 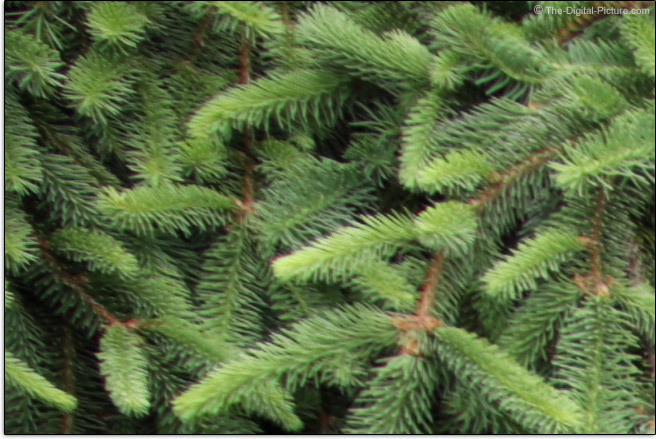 In the 100% crop examples below, we see the fringing colors on specular highlights changing color from the foreground to the background, indicating that these aberrations are present in a modest amount. These aberrations are most-easily seen at the longer end of the focal length range and greatly resolve by stopping down one stop. Flare is an especially destructive effect that some lenses guard against better than others. At wide apertures, this lens does a nice job at avoiding flare effects even with the sun in the corner of the frame. 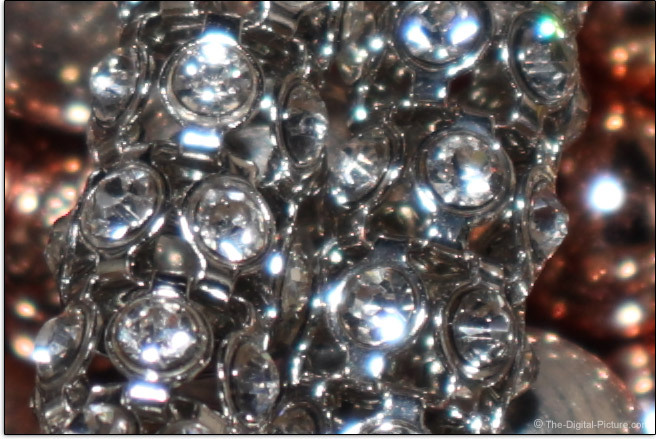 At f/8, flaring effects are much more noticeable and they become still more noticeable at narrower apertures. An always-welcomed lens attribute is a low amount of linear distortion. This lens has that ... but only around the 24mm focal length. At 18mm, there is a strong amount of barrel distortion and modest pincushion distortion becomes apparent at the longer end of the focal length range. Geometric distortion makes framing a scene with a straight horizon, such as the ocean, challenging as there are no lines parallel to the edges of the viewfinder or viewfinder gridlines. Cameras with electronic levels have a big advantage in overcoming this issue, but holding a camera level alone does not render straight lines straight. Most modern lenses have correction profiles available for them and distortion can be easily removed using these (sometimes in-camera), but distortion correction is quite destructive at the pixel level and this technique is seldom as good as using a distortion-free lens in the first place. While this is not the best lens for creating a strong background blur, the quality of the blur it produces (bokeh) appears nice. Following are three 100% crops showing out-of-focus specular highlights and a full image in reduced size. All were captured at f/8. The out of focus highlights remain nicely rounded at f/8, but of course, f/8 is at most 2 stops narrower than wide open where the aperture is completely round. The 18mm results appear a bit harsh, but the 55mm results look nice. Overall, this lens turns in mediocre image quality. But, when the price of this lens is considered, the results do not seem so bad. The Canon EF-S 18-55mm f/3.5-5.6 IS STM Lens' improved focus system was worth every penny of the increased street price over the EF-S 18-55mm f/3.5-5.6 IS II when it first hit the streets. 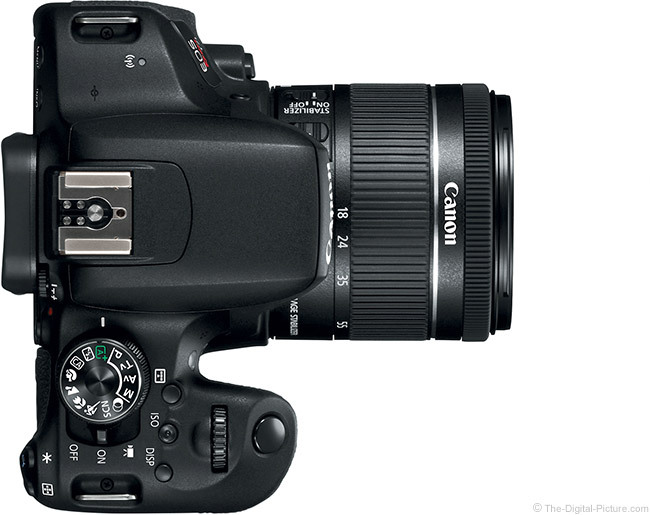 The f/4-5.6 variant has the same system, so it is worth looking at some of these improvements. To begin with, the first 18-55mm STM focuses quickly and very quietly. So quietly that you need to put your ear next to the lens in a quiet room to hear the click sounds autofocusing makes. At the opposite end of the spectrum, the 18-55 f/3.5-5.6 IS II AF was very audible. An additional improvement the first 18-55mm STM lens brought with it – a trait now shared by the f/4-5.6 lens – is internal focusing. 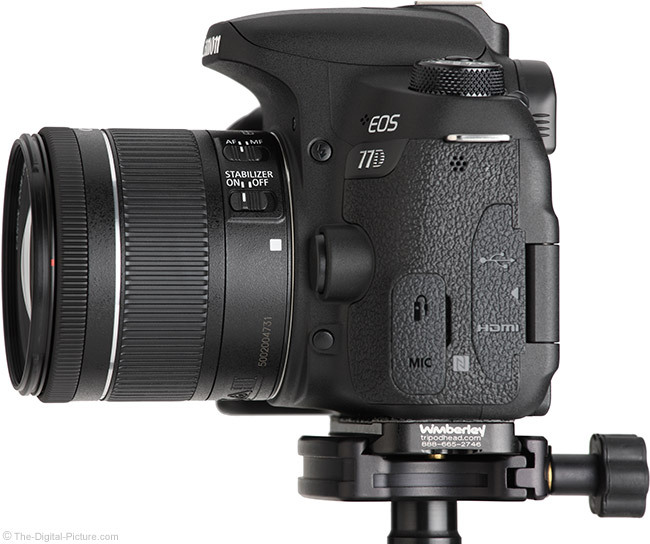 The STM version eliminated the extending and rotating front element found on all previous EF-S 18-55mm lenses. The lack of extension is very nice and the fixed-position front filter threads were a huge improvement – especially for circular polarizer filter use. These filters are rotated to dial in just the right amount of effect and when focusing turns the front filter threads, that effect can be adjusted to something less than optimal. Yet another improvement delivered by the first 18-55mm STM was that the lens hood could be installed without the lens barrel extension turning the focus motor gears to one extent or the other before enough resistance for the hood to turn into (or out of) place was gained. Hoods on the STM lens versions install normally as with most other quality lenses. With a generally deep DOF (Depth of Field), the 18-55 f/4-5.6 STM's AF system is not overly challenged to focus accurately. Still, this model and all of the other Canon STM lenses I've used to date focus accurately and with decent speed. STM utilizes a focus-by-wire or electrical manual focus design (vs. a direct gear-driven system). 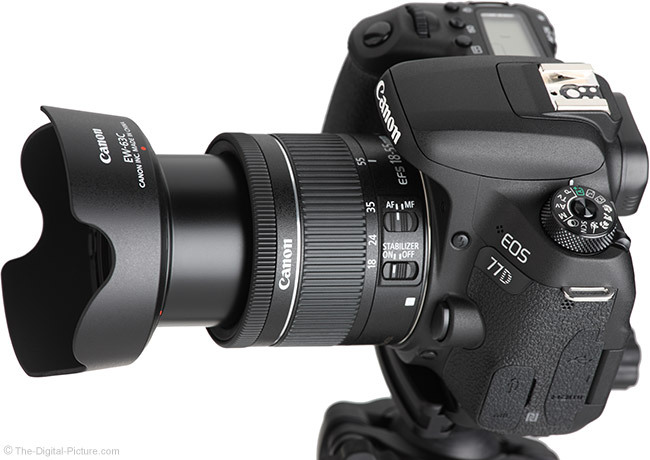 The easy-turning manual focus ring electronically controls the focus of the lens. The lens' switch must be in the "MF" position and the camera meter must be on/awake for conventional manual focusing to be available. With electronics driving AF, the rate of focus change caused by the focus ring can be electronically controlled and it can be variable, based on rotation speed. That was the case with the 18-135 IS USM and I am not surprised to see the same again in the 18-55mm f/4-5.6 IS STM. But, the longer I use these lenses, the less I appreciate this attribute. I thought that I would adjust to the variable MF drive speed, but I instead find it increasingly frustrating. Because of the dual speed MF ring, large focus distance adjustments can be made very quickly while precise fine tuning is made available. But, an inconsistent focus ring rotation rate change can prove somewhat maddening when trying to quickly rock the focusing ring back and forth to fine tune focusing. Using marked focus ring pulls with this lens requires a skillful rate of turn, both in setup and execution of the pull. I'd rather have a single focus ring drive rate. With the camera powered off, this lens is far from being parfocal - the scene goes from in sharp focus to very strongly blurred and back into focus by changing focal length from 18mm to 55mm. However, when the camera is powered on and awake, the lens attempts to be parfocal and it is very close to being so. Movie Servo and AI Servo AF modes will automatically compensate for change in focus during zoom, but otherwise, it is usually a good idea to refocus after a focal length change. Subjects change size somewhat during full-extent focus adjustments. Cameras featuring Hybrid or Dual Pixel CMOS AF and Movie Servo AF make video recording very easy and the STM lenses are very well-suited for this task. Their smooth focusing makes focus distance transitions easy on the viewer's eyes and the sound of the lens focusing is not picked up by the camera's mic. Even the STM lens' aperture changes are quiet and smooth. Instead of a slim, raised, knurled area molded onto the end of the wobbly extending lens barrel as found on the IS II, the first 18-55 STM was fitted with a real manual focus ring and the f/4-5.6 gets the same. The focus ring remains small, but it is incredibly more useful than the old IS II ring. No longer does the image framing change greatly while manually focusing the lens and focus adjustments can be precisely made, though a slight amount of play was present in the review lens. This is a kit lens designed with economy priorities and focus distance indications, such as in a window, have been omitted. The EF-S 18-55mm IS II lens had a very nice maximum magnification spec of 0.34x, the first 18-55mm IS STM took a tiny step forward with a 0.36x spec, one of the best-available maximum magnification specs for non-macro-specific lenses. While the f/4-5.6 matches the previous STM in both minimum focus distance and maximum focal length, it has received a much lower 0.25x maximum magnification spec. 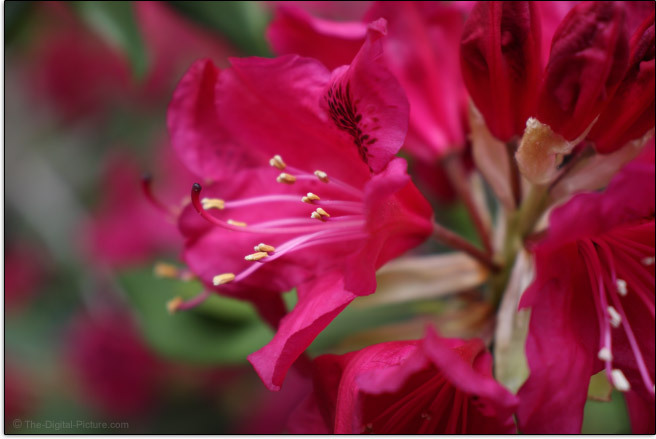 The rhododendron flowers are about 1.5" (4cm) wide. 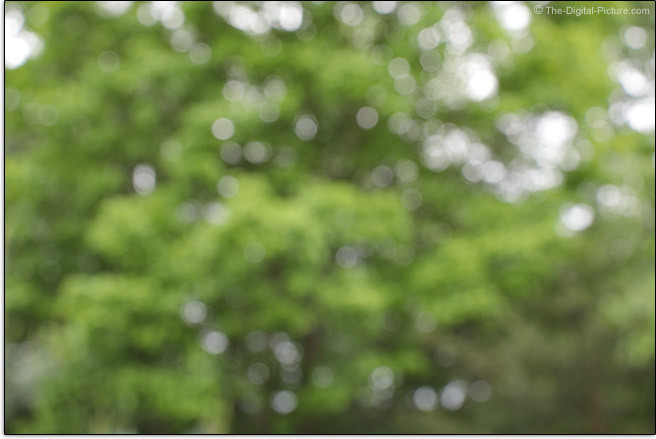 This 55mm f/5.6 example also illustrates that this lens can create some background blur. Magnification from wide angle through standard/normal focal length lenses is generally significantly increased with the use of extension tubes which are basically as their name implies, hollow tubes (with electronic connections) that shift a lens farther from the camera. Doing so allows the lens to focus at closer distances, though at the expense of long distance focusing. With the EF-S 18-55 f/4-5.6 IS STM lens, the magnification range with the Canon EF 12mm Extension Tube II increases to 0.55-0.23x and to 0.91-0.51x with the Canon EF 25mm Extension Tube II. Note that extension tubes are not compatible at wide angles on this lens. 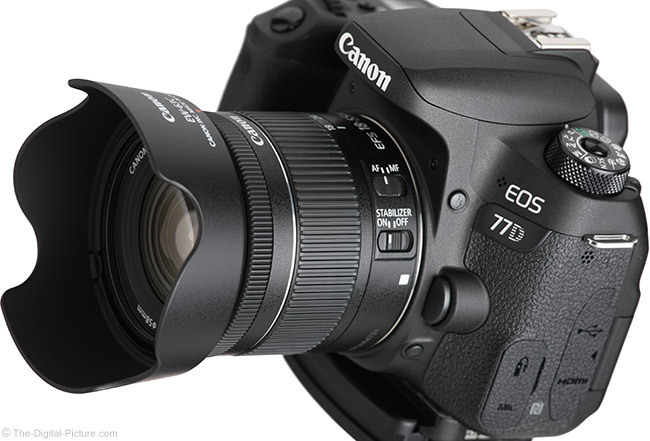 No current-at-review-time Canon EF-S Lenses are compatible with Canon extenders. These extenders are physically unable to mount behind the EF-S lenses. When you buy one of the cheapest zoom lenses available, there are sacrifices being made in the lens design to make that low price possible. Build quality is one area where a sacrifice is frequently made. The zoom ring is nicely-sized (though shorter than the previous 18-55mm STM lens' ring) and it is smooth-operating. This lens extends modestly when zoomed to 55mm, but it is still not a very long lens even at that point. One construction detail that is readily apparent with the rear cap removed is the plastic lens mount. Even slightly-higher grade lenses feature a metal mount. A priority for this lens' design was small size and light weight and it is hard to find complaint about this lens in either of those departments. Few lenses are smaller or lighter, and as mentioned, smaller is one of the benefits this lens brings over the previous EF-S 18-55 STM. You can carry this lens indefinitely without fatigue. For many more comparisons, review the complete Canon EF-S 18-55mm f/4-5.6 IS STM Lens Specifications using the site's Lens Spec tool. It always helps to see a lens beside some of its peers. 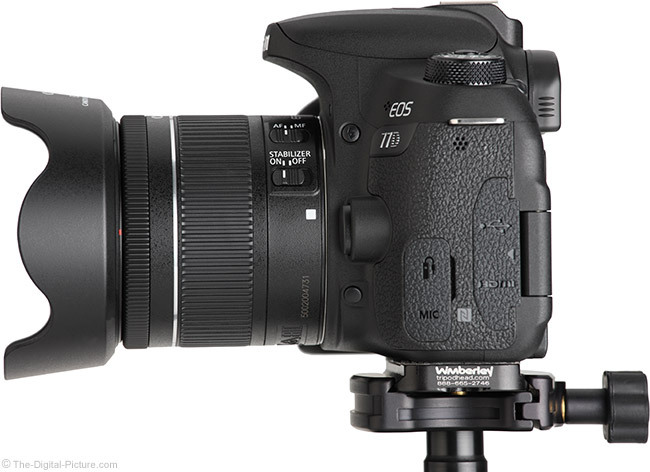 Use the site's product image comparison tool to visually compare the Canon EF-S 18-55mm f/4-5.6 IS STM Lens to other lenses. The 18-55mm f/4-5.6 IS STM Lens, like all of the previous EF-S 18-55mm lenses, utilizes 58mm filters. This filter size is relatively small, popular and inexpensive. While I often recommend using a UV and clear lens protection filter, I rarely recommend low quality filters. In this case, the cost of the quality filter to cost of the lens ratio is high enough for me to give pause to the recommendation. However, a quality circular polarizer filter is worth adding to any lens (unless your photography never makes use of such). Note that a normal thickness CP filter will cause additional vignetting at 18mm. Use a slim model such as the B+W XS-Pro. The new petal hood design adds to the STM's height (and has a higher coolness factor). But, this is a positive change because the new hood provides better protection from bright lights and from impact. Of course, there are probably not too many 18-55mm STM lens owners who will pay the relatively heavy price for the Canon hood. And in that case, this is a moot point. You might find a third party lens hood might be a better option for this lens. Note that the hood will sometimes create a shadow in some images taken using a camera's built-in flash. Without the hood, this little lens will stay out of the flash's light path. 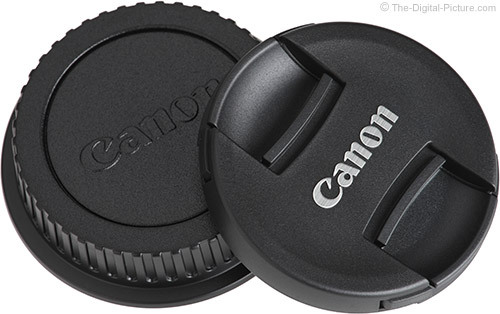 Canon does not include a case in the box with this lens, but the Canon Lens Case LP1016 is specified as being an optional accessory. The LP1016 is a suede-like, draw-string pouch that offers light protection aside from the more-thickly-padded bottom. I suggest considering one of Lowepro's Lens Cases if such a case is desired. These are good quality products with a reasonable price. 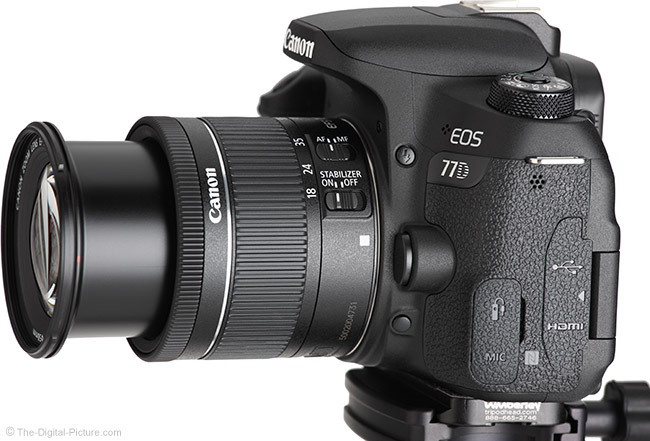 As I mentioned in the beginning of the review, this lens, especially when included in a DSLR kit, is all about value. Its purpose is to provide as much functionality as possible for a very cheap price. It is successful in this regard, but its adoption will be limited to the budget-restricted and to those who are not aware that better lenses exist or aware of the differences the lens makes in regards to image quality. That said, this will be one of the most common lenses in use. As also mentioned earlier, but just to avoid mistakes, this lens is not compatible with full frame cameras. 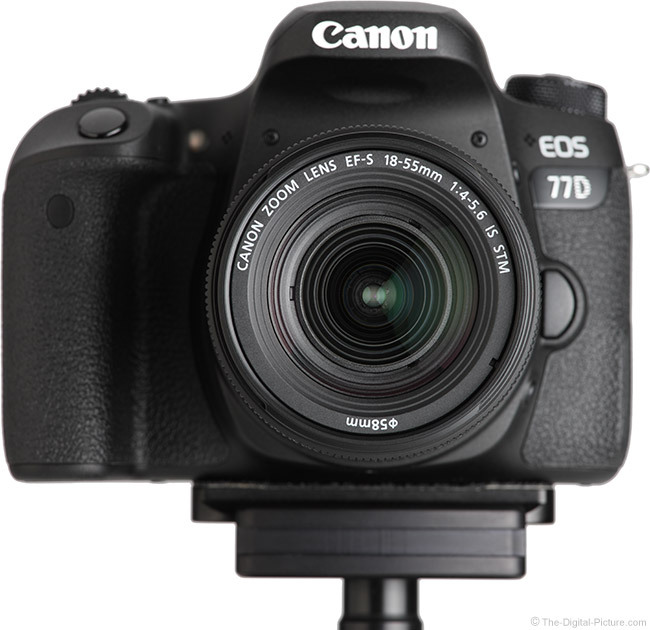 EF-S lenses will only mount on Canon EOS APS-C cameras such as the EOS Rebel series / EOS ***D models (such as the Canon EOS Rebel T7i / 800D this lens shared a press release with), EOS 1***D models (such as the 1300D), EOS **D models (such as the 80D, 77D, etc. 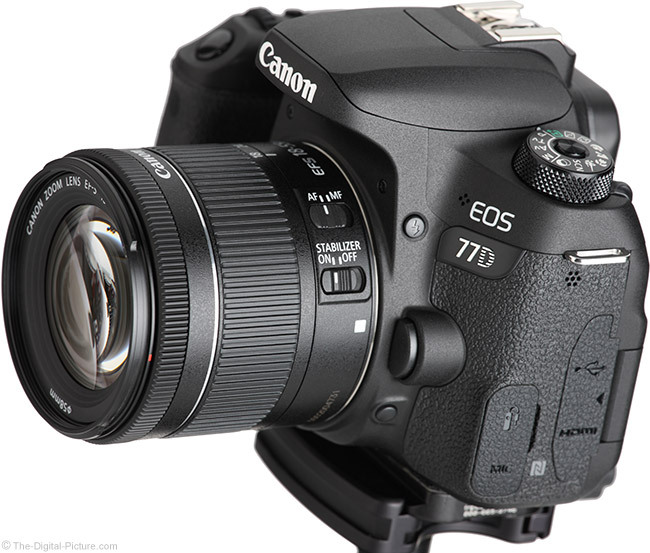 ), EOS 7-Series models and EOS M models via an adapter. The review lens was sourced retail/online. While this lens becomes the best or nearly the best EF-S 18-55mm STM Lens available to date, it is not the best lens in a variety of regards. It may be the lightest and the smallest of similar zooms. It's IS and STM features are desirable assets. But, I suggest consideration be given to the lenses listed in the general purpose lens recommendations. Specifically comparing the f/4-5.6 IS STM to its predecessor, the Canon EF-S 18-55mm f/3.5-5.6 IS STM Lens, we see the older lens performing better in the wide angle periphery and the newer lens performing significantly better at the long end. I prefer the results of the f/4-5.6 overall, though if using the lens primarily at 18mm with scenes requiring sharper corners (such as landscapes), the older lens may be the better choice. The f/4-5.6 has more lateral CA and slightly stronger pincushion distortion at 55mm. The f/4-5.6 is smaller (though not lighter), but it is also slower, having a narrower max aperture over some of the focal length range. The f/3.5-5.6 has a high maximum magnification spec. Otherwise, these lenses are quite similar overall. Need a lens for your kids? The 18-55 f/4-5.6 IS STM is a great option for them for a couple of reasons. One is that the small size makes this lens ideal for kid-sized hands and the light weight keeps photography fun for them – and fun for longer periods of time. Another is that you do not need to worry about them damaging your more-valuable lens(es). Need a potentially sacrificial lens? Sometimes getting an extreme photo is worth risking gear to capture and the low cost of this lens makes it a good choice for potentially damaging situations, especially those without a strong budget behind them. If your wallet is light or you need to keep your DSLR light, this lens might be a good choice for you. But if this lens gains you entrance into the incredible world of Canon EOS DSLR cameras and the impressive image quality they deliver, this lens is worth starting with. You can upgrade to a better lens later. Oh BTW, your phone has terrible image quality. Sometimes, there is a reason why this lens may even be the best choice for bear photography. Not very often, but ... I had a good reason. 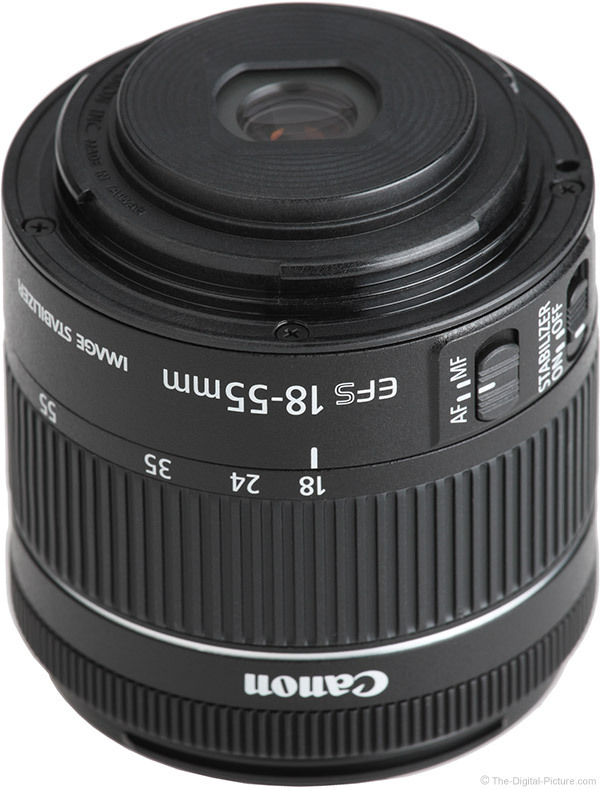 The Canon EF-S 18-55mm f/4-5.6 IS STM Lens is a low end starter lens with reasonable performance. The light weight and small size are big values and the low price tag makes it a good value. The savings of buying this lens in the kit vs. standalone are strong, strong enough to make upgrading your DSLR a good idea vs. buying this lens alone.